I was stuck in the Netherlands when an ask could from a volcano in Iceland downed all the planes in Europe. I ended up getting back the UK on a train, where I shared the luggage section with a guy from California who maps golf courses for a computer games company, and a Dutch au pair. The golf course mapper told us how he only had to work 3 weeks a year and spent the rest of it surfing. The au pair would talk about helping the family she was employed by. It was the first time I’d thought about au pairs or nannies, to be honest. I don’t think I’d known anyone to have them before. I can understand the concept of needing help. 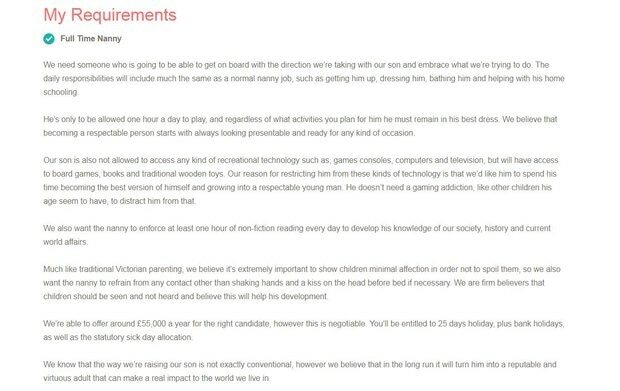 A couple from Ascot offering £55k a year to a nanny to raise their child the Victorian way. This is the full advert. Presumably it will also be OK to send him up chimneys as well as being beaten to the maximum extent that his rickets will allow. The restriction on game time and reading non-fiction to expand his horizons are understandable. However, I found the advert disconcerting. “Only to be allowed one hour a day to play” after home schooling with minimal contact and affection sounds to me like the “best version of himself” that this young man could become is one with a knowledge, but no understanding of, social interaction. The parents obviously want him to have a job more in line with prime minister than designer. I don’t know if I’ll ever get to be a parent. What I’m grateful for in the modern world as opposed to that of a century ago, though, is the thought that children can experience all manner of things. Now maybe more than any time, a child is able to decide themselves what their best version looks like, whether that’s anything from mapping golf courses and surfing or helping other people.